Proof Of Citizenship Up In Flames After California Wildfires "The little that we had is gone": Immigration status can compound the loss families face after devastating wildfires. A swing set is all that remains in the backyard of a house in Middletown, Calif., after a devastating wildfire. Birth certificates and marriage licenses were among the important things destroyed. 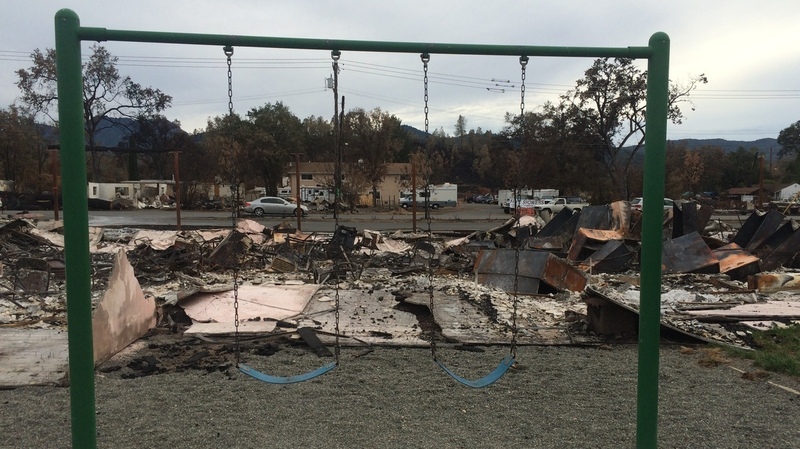 When a wildfire destroys a home, it leaves people's lives in disarray. For undocumented workers — many of whom don't have insurance or savings — it's even harder to recover. "We lost everything because we couldn't salvage anything," Patrica Madrigal says. 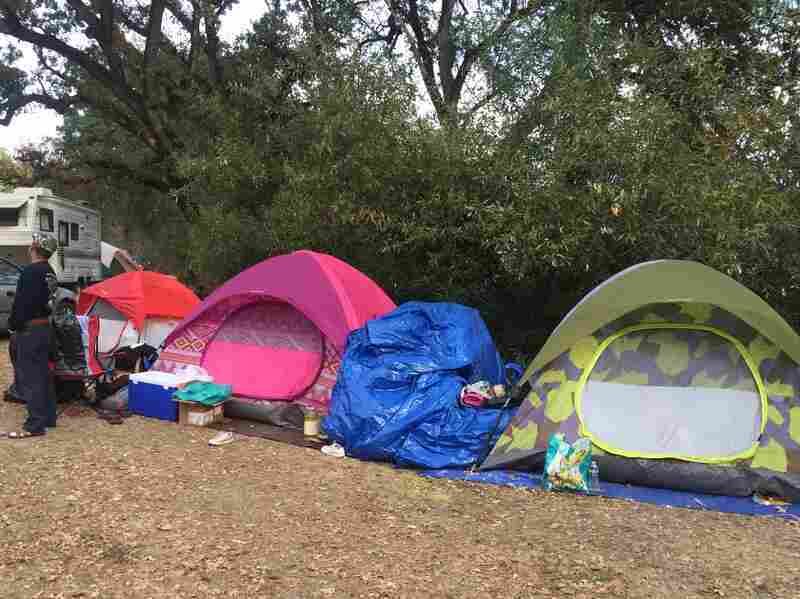 Her and her family's immigration status is complicating their losses during California's recent Valley Fire, north of Napa. Madrigal unloads donated clothes into her new temporary home: a yellow dome tent at a campground outside the small community of Middletown. Her eyes fill with tears. "It was all of the sudden. We were living in the moment because it was so traumatic," she says. Madrigal moved to California from Mexico illegally seven years ago. Since then, she has washed dishes for a retreat center. Homeless fire victims live in tents like these in Middletown, Calif. Patricia Madrigal's tent is yellow and gray. Now that center and Madrigal's home are ashes. "The little that we had is gone," she says. That includes her Mexican marriage license, her daughter's birth certificate and any proof that the family has lived in the U.S.
She has contacted the Mexican Consulate to see if duplicates can be made, but so far, the process has been overwhelming. "I'm so sad for what happened. We never imagined this," she says. Madrigal's 19-year-old daughter, Jacqueline Burgueno, sits hunched over on an ice chest just outside her tent, listening to her mom cry. Burgueno was home alone when she had to evacuate. "I didn't get anything. I was too nervous to grab anything," Burgueno says. Everything was lost, including her work permit and her Social Security card. Burgueno was born in Tijuana but she has temporary legal status under the federal policy Deferred Action for Childhood Arrivals, or DACA. She expects she'll be out of work for at least two months while new documents are processed. That leaves her wondering how she'll continue to pay for nursing school. "I was thinking of getting a full-time job and see how I could help," Burgueno says. She doesn't want to drop out of school but is considering the possibility. The area of Middletown where many Latinos lived has turned to dust. "All the apartments, you can see it's just powder," says Veronica McGee, who volunteers as a translator for homeless Spanish speaking families. She points to an ash-covered lot. The skeleton of a truck sits in what used to be a driveway. A statue of St. Francis of Assisi stands in the ashes next to a rusty tricycle. Later that night, McGee is translating at a community meeting at the local elementary school, where FEMA representatives are on hand to talk to victims about available aid. Families listen attentively. There's a palpable fear in the air. FEMA representative Allen Anderson assures them that he won't turn them in to immigration authorities. "Our concern is to keep a safe, sanitary roof above your head," Anderson says. Anderson tells them it's safe to list their full names on forms. "If you have one legal family member in the household we can register you, that can be even a 3-day-old baby," he says. Madrigal takes the FEMA forms and says she'll consider filling them out back at the campground. But despite those reassurances, Patricia Madrigal is terrified that she'll be deported to Michoacán, Mexico, where she's from. "There's lots of killings where we are from. There's lots of violence. There's no justice or security. There's nothing there," she says.